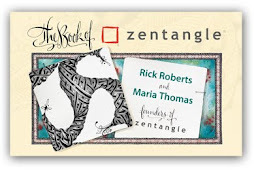 Zentangle: Get thee to Texas! Specifically to Irving, near Dallas-Ft. Worth. That's where Angie Vangalis, CZT, [email] is putting on an exhibit of Zentangle-inspired art created by some wonderfully talented people. 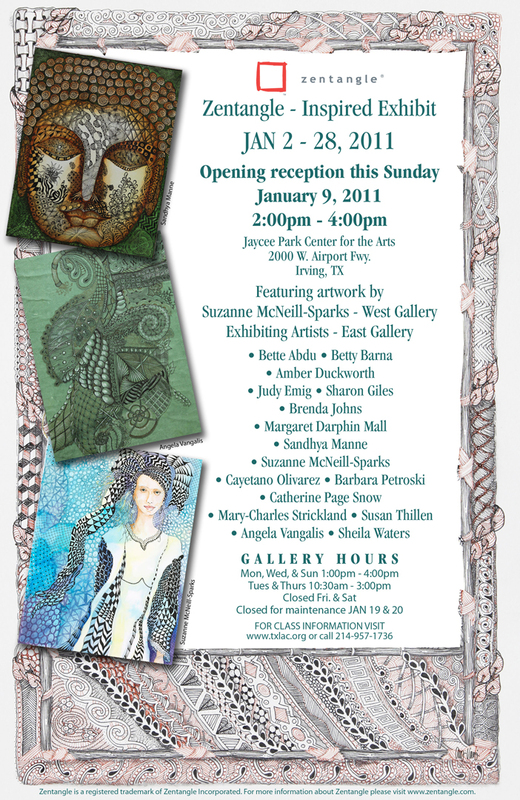 If you're in the area, you have until January 28, 2011 to enjoy this exhibit which fills two galleries. How exciting! Good luck with the exhibit, Angie! I really wish I could get me to Texas. What a treat it would be to see this!!! I'm hoping we get to see photos someday! Best of luck to all the artists! Oh, I love it! I wish I could attend! I wish I could be in it! i'm sure it's an amazing exhibit! Yes, the poster is gorgeous! Oh wish I could have been there!Good luck with the exhibit!! Wow! How exciting!!!! If I only could, I certainly would! Congratulations on your exhibition, the poster is amazing to start with so I am guessing the show will be spetacular!